I am pleased to have received an endorsement from Ola Mitchell, the President of the Bridlewood Neighborhood Association. Ola has been serving in that capacity for almost nine years and is a strong advocate for her neighborhood and surrounding communities. We have worked together on several issues in her neighborhood and Ola has helped me as much as I've helped her. I am honored to have received Ola's endorsement. 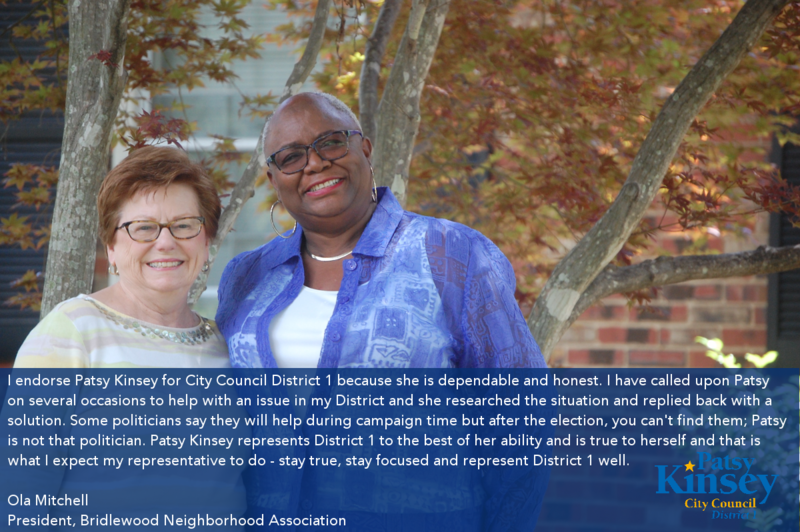 I endorse Patsy Kinsey for city Council for District 1 because she is dependable and honest. Patsy has remained the same in her voting and representation of District 1. I have called upon Patsy on several occasions to help with an issue in my District and she researched the situation and replied back with a solution. Some politicians say they will hep during campaign time but after the election you can't find them; Patsy is not that politician. She has been criticized for not always voting along with her other Democrats but Patsy votes from her heart and does what she believes is best for the City and her District. Patsy Kinsey represents District 1 to the best of her ability and is true to herself and that is what I expect my representative to do - stay true, stay focused, and represent District 1 well.